President Coolidge receiving his running mate, Charles G. Dawes, at the Homestead. Photo: Library of Congress. 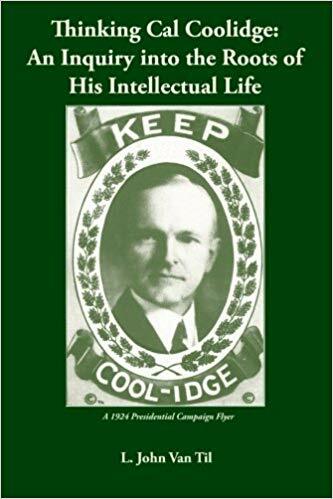 Unequivocally, for President Coolidge, the strongest place for retreat on God’s earth was the Homestead at Plymouth Notch, Vermont. Here he was born, here he grew up, here he began a lifelong education, here he brought his bride, here his mother, sister, grandparents and great grandparents, and in time, his stepmother, father, and sons came to rest on the hills surrounded by the sound of a constant brook running beside its peaceful folds. 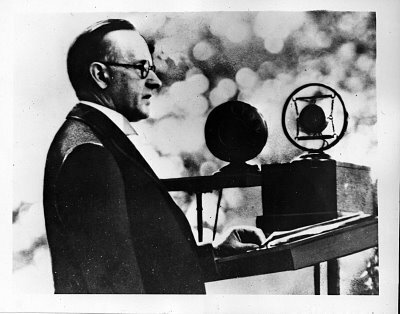 Here the dramatic developments of ninety-five years ago took place, when news of President Harding’s death earlier on the evening of August 2, 1923, could have reached the only phone in the small, quiet village had it only been heard. That phone, located in the General Store across the street from the Homestead, was never answered because Miss Florence V. Cilley was already asleep in the back rooms of the home attached at the rear. Thus, with no direct line to notify Vice President Coolidge of events, Winfred Perkins (the “telephone man,” as Colonel Coolidge dubbed him) took down the message as it came to his wife, Nellie (the switchboard operator), from White River Junction to their home in Bridgewater, eight miles from the Notch. Mr. Perkins jumped in his vehicle and sped out to the Homestead. He reached there just around midnight, awakening the Vice President’s father asleep in the front room. Perkins then returned to his car and prepared to head home just as others began arriving. Seeing another car pull up, he paused to consider his options. He would eventually take a reporter back to Bridgewater and go home. The reporter would strategically tie up the switchboard in the Perkins home for the next four hours as correspondents struggled to break the unfolding story. The honor of covering the Homestead Inauguration, however, would go to 22-year old Joe Fountain, editor of the Springfield Reporter. Just moments behind Perkins were Coolidge’s chauffeur (Joe McInerney), stenographer (Edwin Geisser), and William Crawford (working on a story about the Coolidges for Colliers magazine) – all rooming together in Bridgewater – bringing the Pierce Arrow (the Vice President’s car) out to Plymouth. They tumbled out of the automobile and into the house only to find word had already reached the Coolidges and the residence was waking up. The telephone at the Store became a vital tool for the next few hours. More arrived and by 2:47 in the morning, having checked the exact wording of the Oath in the Constitution, Calvin Coolidge was inaugurated by his own father, a notary public, in the sitting room at the front of the house. Then, he and Grace went back upstairs to sleep a few more hours before heading to Washington later that morning. It is this simple and homespun event that is reenacted on the porch of the Homestead each year. I was honored with the role of Mr. Perkins in this year’s reenactment, the one who delivered the message of President Harding’s death. President and Mrs. Coolidge welcoming visitors to the Homestead, including this veteran of the War of 1861-1865. Photo: Library of Congress. Plymouth remains a hallowed place for me, and the opportunity to see it firsthand is unlike any other I have ever known. My wife and I often observe, after years of studying them, Calvin and Grace live in our house, they are part of our family. That is why this voyage meant so much. At Plymouth, I catch a glimpse of its restful and recuperative qualities, some of the clear reasons Coolidge returned whenever he could. I felt the refreshing debut of its morning air (cool at first but greeted gradually by the warming puffs of summer), the daily routine as nature awakes with the dawn, bird’s voices rising on cue accompanied by the stream beside the cemetery as the hills begin emerging from the fog. All of this wonder unfolds without fanfare just as God endows it, not unlike Mr. Coolidge’s character itself. It becomes evident what filled this place with meaning for President and Mrs. Coolidge, made it so difficult for Colonel John to leave for Washington (choosing to stay at Plymouth instead), and what brought Cal and Grace back – away from it all, even their home in Northampton – to reconnect and restore what only this place could provide. It was impossible not to be affected deeply by my visit here. In a real way, they felt very close, almost as if Mr. Coolidge might just walk around a corner in his familiar way in the midst of playing some prank or engaged in some errand on the property. I was glad, especially where the bodies of the family wait for eternity’s final reunion, for the time they seemed to generously set aside for me in their company. It was just like them. The mailbox where Colonel John, the President’s father, received his mail, residing at Miss Cilley’s General Store. The infamous phone that was never answered the night the calls came in that President Harding had died. It was the only telephone in town…and thus the news had to be delivered by hand through none other than Winfred Perkins, the “telephone man” driving 8 miles from his house in Bridgewater to relay the stunning developments. The house where Calvin and his younger sister Abby were born, attached to the General Store and across the street from the Homestead. The bed on which Calvin and his sister Abby were born. A doll belonging to Abby. Parents of President Coolidge: John and Victoria. One of the striking things about the homes at Plymouth are the original furnishings belonging to the Coolidge family, carefully preserved on site. A reproduction of the weather vane constructed by the Coolidge’s youngest son, Calvin Jr., before his untimely death at age 16 in 1924. It was taken down by Grace Coolidge after the young boy’s body was laid to rest at the cemetery while a spruce from the lime kiln lot was dug up and prepared for transplanting on the South Lawn of the White House upon their return that July of 1924. Note: the saddle near the bottom of the photo, used by Calvin for riding the family horse. Was this what he was using when he broke his arm as a boy? One the hay rakes given to President Coolidge by Colonel and Mrs. Treadway, August 1924. The sitting room where it all began: The oath of office being administered in the early morning hours of August 3, 1923 to Calvin Coolidge by his father, a notary public. Calvin’s paternal grandparents, Grandpa “Galoosh” and Grandma Sarah Almeda (or “Aunt Mede”) lived here…a short distance across the fields from the Coolidge Homestead. The dark ram making clear who gets first scratch. Where the Sprague Farm once stood. The cheese factory started by the President’s father, continued by the President’s oldest son and still going strong today. John Coolidge, the President’s son, offering samples of his cheese to a visiting Swiss delegation. One of the Wilder Barns. The renowned cannon moved from Plymouth Union (at the bottom of the hill) up to the Notch, where it stayed…with young Cal’s help, it seems. Another of the Wilder Barns. Gifts for Grace during their stay at the Custer Game Lodge in South Dakota…beaded purse and moccasins. Chaps, boots, hat, and headdress – given to the President while in South Dakota (1927) – all displayed here for the first time. Thanks to Forbes Library for loaning these to this fine exhibit. This stuffed fox was another, less comfortable gift…in fact, I’m sure I will be recovering from the nightmares eventually. The headdress given to President Coolidge, which he gladly wore and in which he posed, summer of 1927.